PETERBOROUGH, ON – Publican House Brewery has announced the release of a new limited edition beer to mark an important milestone for the brewery. A well balanced largered ale uniquely crafted in the style of an American Maibock. Golden Amber in colour. Rich aroma with notes of butterscotch, dried apricot, sweetened bread and candied sugar. Our 10th Anniversary Maibock is sensibly hopped and malt forward in character, slightly sweet with hints of toffee, honey, bread and nuts. Unfiltered, medium in body with an enjoyable mild finish. 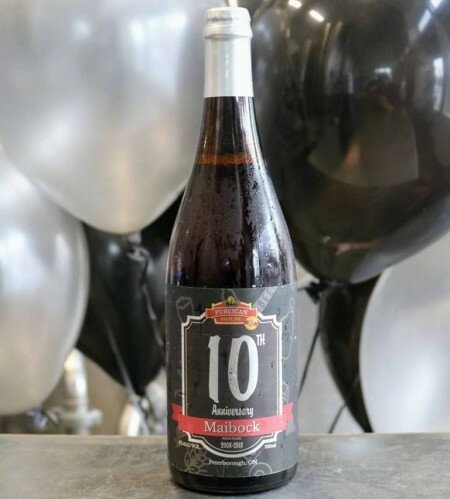 10th Anniversary Maibock is available now in a limited run of 1000 x 750 ml bottles, available exclusively at the brewery for $10 while supplies last.